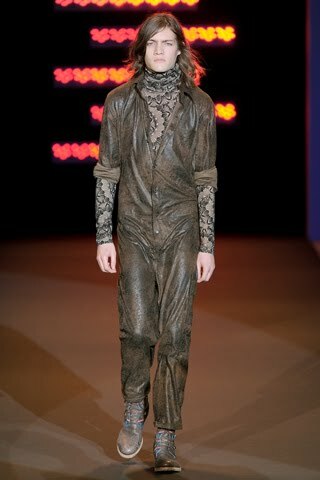 For Fall 2011, Custo Barcelona started with some simple things, overalls/jumpsuit below, before reverting to form with more elaborate creations, left. Photos from Getty Images. BEST IN SHOW – The little boy was walking down a path and he came across a rattlesnake. The rattlesnake was getting old. He asked, "Please little boy, can you take me to the top of the mountain? I hope to see the sunset one last time before I die." The little boy answered, "No, Mr. Rattlesnake. If I pick you up, you'll bite me and I'll die." It continues “… Just before he laid the rattlesnake down, the rattlesnake turned and bit him in the chest. The little boy cried out and threw the snake upon the ground. "Mr. Snake, why did you do that? Now I will surely die!" The rattlesnake looked up at him and grinned, "You knew what I was when you picked me up." Indeed, one wondered what is was all about as the first looks were chaste by CB standards (for men, a brownish jumpsuit in distressed leather or wool over wool-based graphic jacquard). Then a shift was noticeable by the time of the arrival of the mini-tent dress with dropped waist and cap sleeves. The shoulder of the sleeve is a landscape of alternating gray baby fringe and a green/brown/yellow riptide-like pattern. The same riptide pattern appears on the ruched waist band, as well as a section of the skirt part of the dress where it shares space with both a stripe and floral pattern dominated by purple, black and seafoam green. This latter pattern is repeated in a more muted color palette on one of four sections of the top. All are laid under cording that resembles a chainlink fence. Finally, there are tights/leggings and shoes in complimentary colors. Clearly, words cannot do it justice. It is a massive amount for the eye to take in, yet it does not cause eye fatigue. The dress is a little work of art. 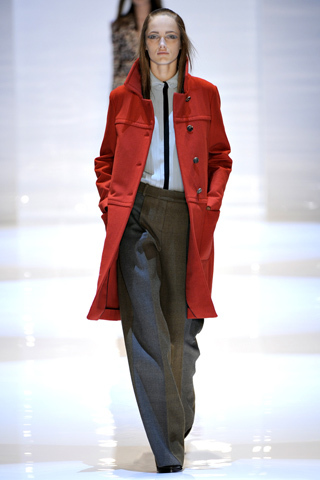 Diane von Furstenberg pays tribute to American Legends in her Fall 2011 collection. For her efforts she gets a mention for "Best Interpretation of a Vision." Stay tuned for the deets. A snake is a snake and Custo Barcelona is Custo Barcelona. Like a thrillseeker – CD goes as close to the edge as possible, then pulls himself back at the last minute before he plunges to his death (The bell-shaped, long-sleeved, jewel-neck aqua-multi dress with fringe on right shoulder, left side and on either side at the hem; with it, matching tights and red-fringe boots. He’s working a lot with wool this season and doing very well indeed, using it as fringe and distressing it; making it look like other fabrics such as organza and jacquard (animal-print leggings and matching top). Not everyone has the gift to throw five to seven patterns/textures together and maintain his/her equilibrium. Somehow, CD manages to pull off this hat trick season after season and it always seems fresh and relevant. And it is not solely that he can juggle these seven balls at a time. It is the results he achieves, which can be breathtakingly beautiful or “uber-naturally” hip. Or just leave one speechless ... for better or for worse. Custo, to thyself stay true. Tory Burch showed ensembles from her Fall 2011 collection in a surprising format. It offers fashion seekers an opportunity to get up close and personal with the clothes and the models. There are no seats in The Box. One and all get an equal view if they are assertive enough to make elbow room for themselves next to the photographers and others snapping photos. TB’s show was in a runway venue called The Studio, which has a three-tiered seating structure. Out came the seats and the result was a spectator sport in true fashion: Anybody viewing the TB show would do so standing, not sitting. Several models lined up on either side of the runway entrance, then took their turn walking the plank. After the finale when models walk single file down the runway before the designer comes out to greet the crowd, the lights went down for a few seconds before coming up again. This marked the start of the show all over again and again and again. Yes, a continuous loop for an hour, allowing far more of TB's followers and anybody who happened into the venue to see the designer’s collection. In the loop was plenty of plaid and hip-hugging flared pants. A luxurious red velvet pantsuit was a standout. A Shetland coat from the Derek Lam Fall 2011 collection. This was translated into fluid winter ensembles relieved of bulk, resulting in sleek, tailored ensembles. Using red stretch double-faced wool, DK crafted Shetland coats and brought into being a glamorous gown with a casual flair. A red lambskin leather jacket paired with a gray wool stretch flannel trouser was definitely packing heat. The Cynthia Steffe ruffle dress isn't one of the brighter spots in her Fall 2011 collection. BEST ENCOUNTER – He stands tall at the Lela Rose show. His lean physique is perfectly fit for his black suit. He isn’t a model, but he could be one were it another time and another place. What sets him apart from the crowd is the tall, black hat and the long, black curls cascading down the side of his face. Mortcha Rosenfeld is a Hasidic Jew, designer and co-founder of Claideur, an international fashion company that specializes in both Hasidic wear and secular fashion. His offices are in Boro Park, Brooklyn. “It’s my first time at Fashion Week since I’ve been in the business the past 15 years,” he discloses. “It’s time for the unveiling,” pipes in his companion and co-founder, Yumi Schon. He is significantly shorter but just as fashionably dressed in Hasidic garb. journey. And although they had been crushed in the back of the standing-room only section of the Studio, they made their way to the front row as the crowd streamed out. Their cameraman began shooting, and their fashion week history was in the making.